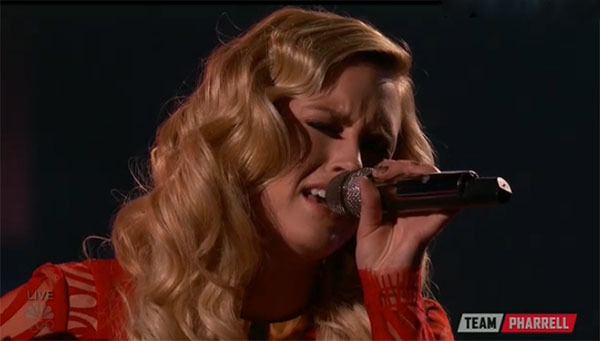 Hannah Huston from Team Pharrell sings ‘Every Breath You Take’ on The Voice Season 10 Finale Top 4 live performance show on Monday, May 23, 2016. “That was so risky but I think it’s gonna be a huge reward for you. That was beautiful. It’s Brilliant,” said Blake Shelton. Top 4 finalists includingAdam Wakefield, Alisan Porter, Hannah Huston and Laith Al-Saadi will perform live for your votes. Each will perform three songs — a solo song, a duet with their coach, and a original song. Did you like Hannah Huston’s song cover? Share your thoughts and views on the comment section below.